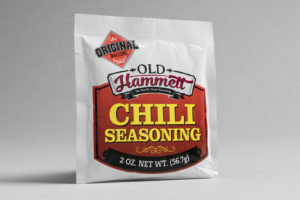 Over 30 years ago, Hammett Chili seasoning was introduced into the Oklahoma market. This small regional chili seasoning made an impact on the marketplace, selling against larger brands of chili seasonings with the promise of a great-tasting “No Heartburn Chili”. When starting his own specialty foods brokerage company in 1989, Don Holman remembered this popular brand and sought it’s owner for the rights to not only promote, sell and distribute it, but to own it and rebrand it for a wider market with goals of national distribution. After a successful rebranding to Old Hammett, the goals of national distribution were realized with distribution agreements with large multi-state national grocery chain retailers. The original recipe was to be made with only water and no tomato products. 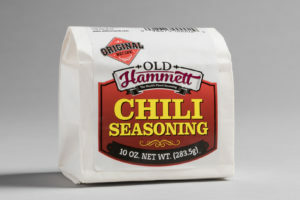 Over the years many championship recipes have been produced using Old Hammett as the base seasoning. 1 oz. seasoning + 1 lbs. ground beef + 1 cup water = Incredible batch of chili! Some of our favorite recipe combinations are located on the back of our package. Depending on your preference and our recipes, you’re sure to find one you enjoy! We enjoy the many testimonials, claims of our recipe being judged as blue ribbon-winning and our biggest differentiator… being known as “the ONLY no-heartburn chili”. We have served this recipe at many food shows, home and garden shows and various other trade shows around the nation to literally thousands of people. Today, we make this award winning recipe available at the finest meat and butcher shops, grocery retailers throughout the nation. Now, ordering and shipping are available online for your convenience. 2oz package and 10oz packages available in singles, cases or bulk. See package details for more information on serving portions.